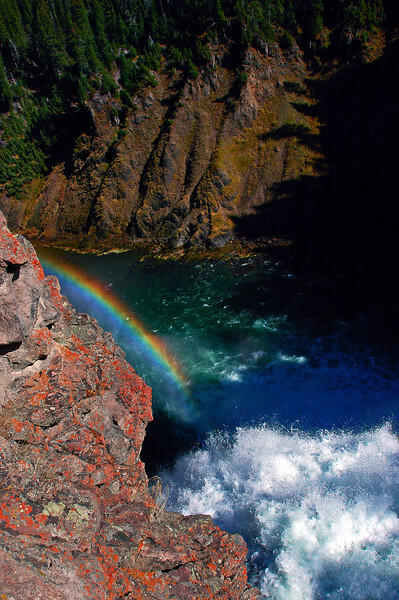 A rainbow at the base of the Lower Falls of the Yellowstone complimented by red lichen-encrusted rock absorbing the awesome power of the Yellowstone River. That's a lot of water generating all the lovely foam, These falls are the largest volume waterfall in the Rocky Mountains of the US. The volume of water flowing over the falls can vary from 63,500 USgal/s (240 m³/s) at peak runoff to 5,000 USgal/s (19 m³/s) in the fall (courtesy Wikipedia ( http://en.wikipedia.org/wiki/Yellowstone_Falls ) ). This photo was taken from the brink of the lower falls pointing down to the rainbow at the base.